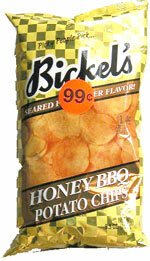 Bickel's packaging is as simple as it gets, and there's nothing wrong with that. The gold matt / shiny gloss checked effect works well. The graphic image of the Chips could be a clear window to the contents and the logo is large but not obtrusive. The colors also contrast it well with other flavors in their range. A light crispy Potato Chip that crunched nicely when bitten into. To get the best out of the crunch you need a few at once, which wasn't hard! The Chips were fairly thin, but they had a really nice orange colored powder residue dusted on them which combined with a small amount of grease to stick on the fingers. There was not much of a smell when the bag was opened. The taste was a little sweet, but not particularly strong. If anything the flavor was overly mild. There wasn't much sign of any sort of barbecue flavor and a more savory taste would have been preferred.